Pastiera is a a traditional Neapolitan dessert with ricotta and rice or cooked grain usually made with a lattice crust. This Easy No Crust Easter Pastiera version has all the delicious flavor and is so simple to make! 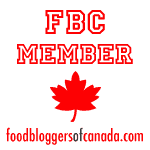 This post was originally published April 2015 and modified March 2019. 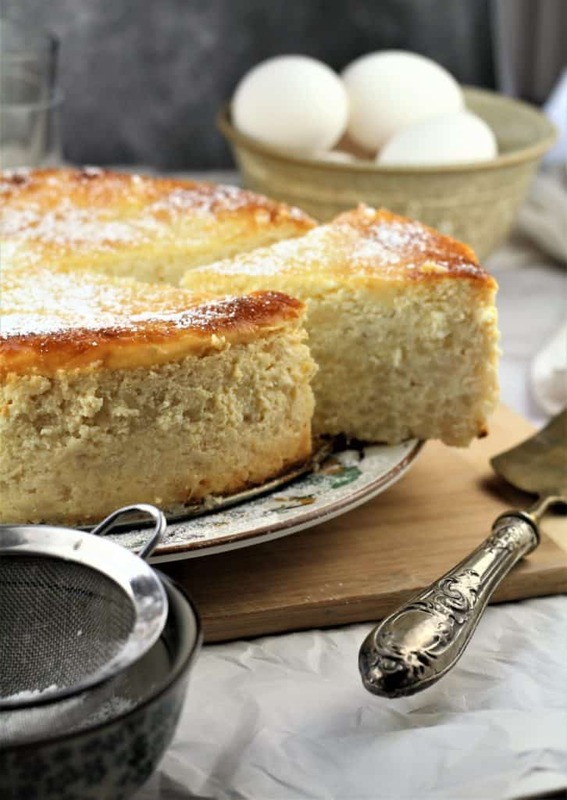 Thank goodness there is no shortage of desserts to make with ricotta! And I have found yet another one. I can’t believe I only found out about Pastiera just a few years ago. Of Neapolitan origin, this dessert was created to celebrate the return of Spring. However, Pastiera has now become a typical Easter dessert. The traditional recipe is made with a pie crust and a pretty lattice top. The filling consists of rice or grano cotto, cooked wheat, combined with ricotta. I was inspired by a Martha Stewart recipe I came across to make this Easy No Crust Easter Pastiera. Now I know many of you will say it’s not the real thing if it’s not made with the crust. But the truth is I don’t always feel like making pie crust. And I’m sure you don’t either! This version of Pastiera undoubtedly has all the delicious flavor even without the crust. Besides, no crust means less calories, right? Which means I can have more Pastiera! No crust also means you can make this Pastiera in a flash so you can enjoy it as soon as possible! Let me walk you through the steps to make this Easy No Crust Easter Pastiera. Begin by cooking your rice. Bring milk to a boil. Add salt, vanilla extract and cinnamon and stir in the rice. Cook until tender, about 30 minutes. 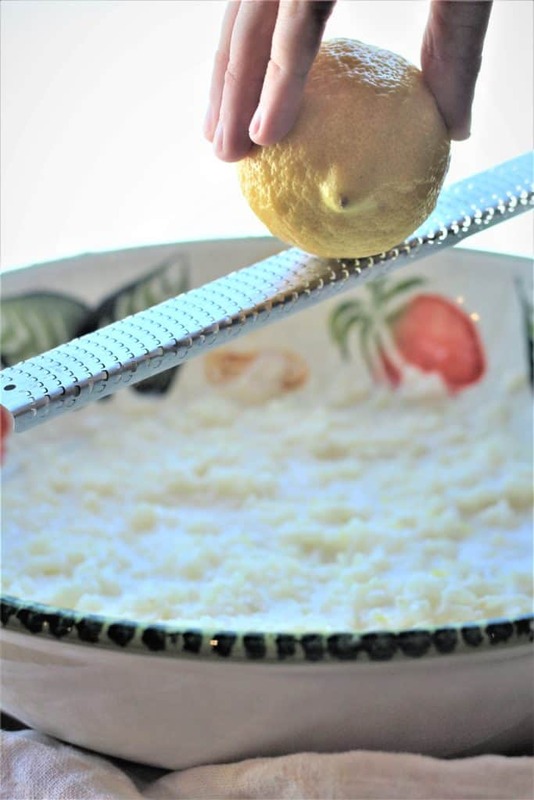 Transfer the cooked rice to a large bowl and stir in the zest of 1 lemon and 1/2 cup sugar. Let cool completely. Meanwhile, if the brand of ricotta you use is particularly watery, let it drain by placing your ricotta in a colander covered with cheese cloth. Let sit in the fridge for about 2 hours to drain. 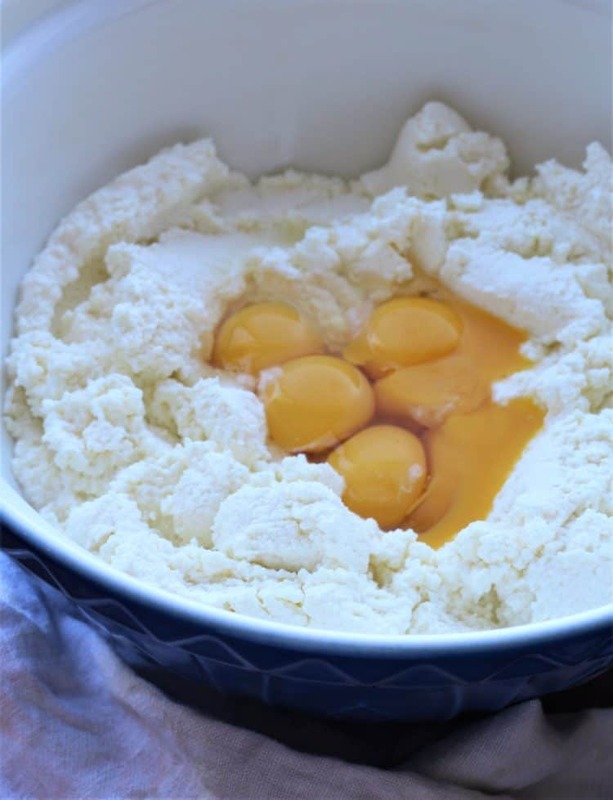 Place the drained ricotta in a large bowl and add 3 eggs; 3 egg yolks; and an additional 1/2 cup of sugar. Mix well. Fold in the cooled rice mixture with a spatula. Pour the mixture in a greased and floured -8 inch springform pan. Set the pan on a baking sheet (in case the batter leaks) and bake at 350F for about 90 minutes or until the top is golden. Let cool completely before sliding a knife around the edge of the Pastiera to remove the ring. Dust with powdered sugar before serving. 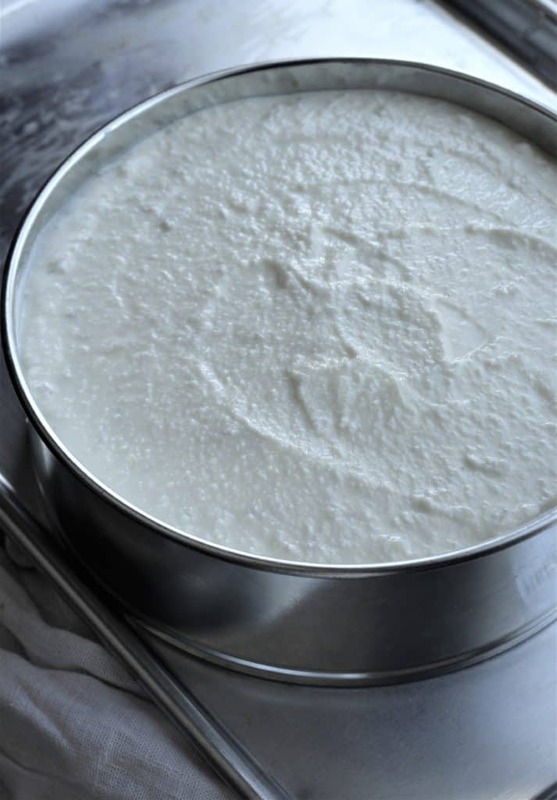 It is important to drain the ricotta of excess water. If the batter is too wet, it will take forever for the cake to set while baking. Trust me, I know this! The cake will still be slightly jiggly in the center when you take it out of the oven. However, it will set as it cools so resist the temptation to over bake it. I recommend you make it a day ahead as it tastes better after it has been refrigerated and the flavors have had time to blend together. If you give this recipe a try, please let me know by tagging me with #mangiabedda on Instagram. Happy Easter to all! This simplified Pastiera is a take on the traditional Neopolitan recipe which is usually made with a pie crust. Easy No Crust Pastiera has all the flavor but less work! In a large sauce pan, bring the milk to a boil over medium high heat. Add the cinnamon, salt and vanilla extract. Stir in the rice. 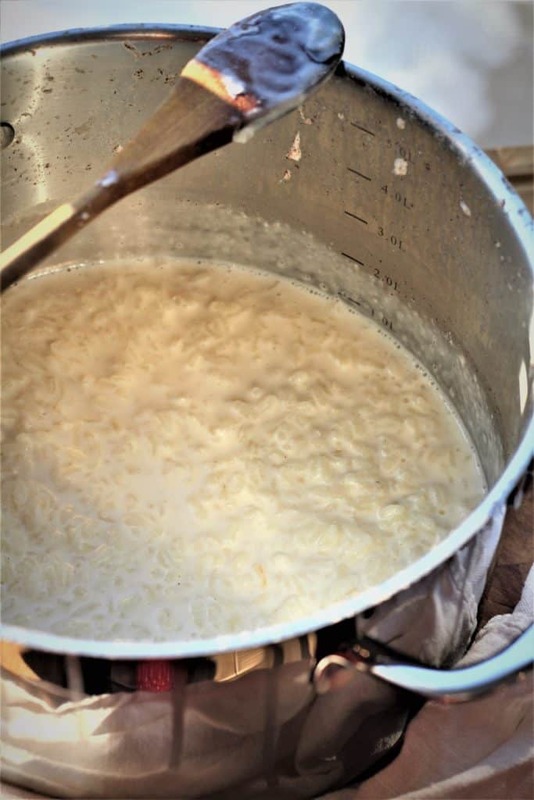 Reduce to a simmer, cover and cook until all the milk has been absorbed, about 30 minutes. Stir occasionally. Transfer to a large bowl and stir in the lemon zest and 1/2 cup sugar. Let cool completely, stirring occasionally. Preheat the oven to 350°F. Butter and lightly flour an -8 inch springform pan. 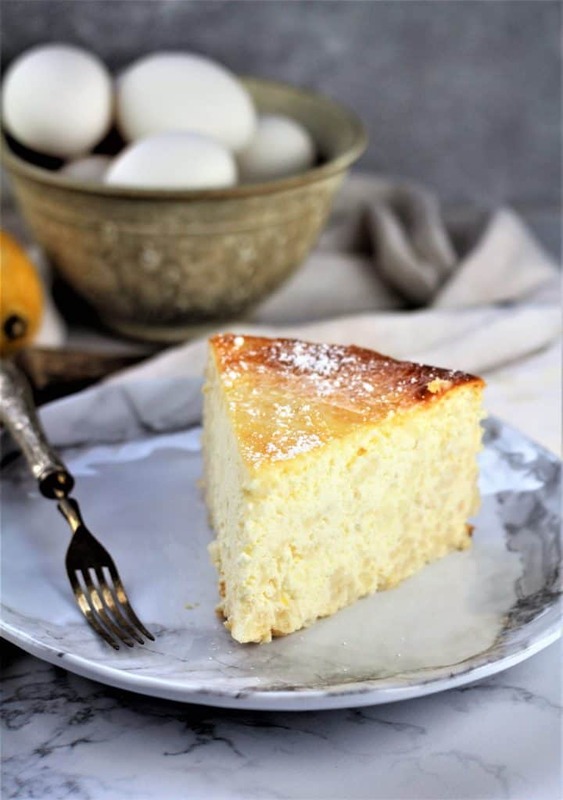 In a large bowl, combine the ricotta, whole eggs and egg yolks and remaining 1/2 cup sugar. Use a spatula to fold in the cooled rice mixture. Pour into the prepared pan. Place pan on a baking sheet in case of leakage while baking. Bake about 90 minutes, until golden. Cover with foil if starting to brown too much. Transfer pan to cooling rack. When the pastiera has cooled completely, run a knife around the edge to loosen the ring before removing it. Dust with powdered sugar before serving. Keep refrigerated. It is important to drain the ricotta of excess water. If the batter is too wet, it will take forever for the cake to set while baking. Oh wow it looks delicious!! Sounds delicious! My mom makes something like this and she adds candied fruit and makes it on a baking sheet so not so thick and comes out in squares. Hope we are getting some on Sunday! Pastiera is my favorite Easter dessert. I had a friend whose mother was from Naples and every year I waited longingly for a slice of her Pastiera. Hers was the traditional: beautiful crusty pie with an intricate lattice work. Inside, a creamy delicious filling of ricotta, wheat and candied fruit, with an amazing orange blossom flavor. I have never attempted to make it and I must say your version seem absolutely lovely and one that I might try baking. I haven't tried the original version but since I don't consider myself a great baker I was enticed by this simplified version. Besides I love anything with ricotta! I am with you! I love anything and everything ricotta! This is a wonderful recipe and I can’t wait to try it at Easter! Thank you! Hi Annie, all ricotta all the time for sure! I hope you enjoy it. It's definitely not like the traditional recipe with the crust but the flavor is there and I like that it's so easy to make. Enjoy! My mother-in-law used to make pasteria for Easter. She made it with a crust and lattice top. I loved it but found it too filling. I am going to make your version. I just bought 3 pounds of drained ricotta at Berchicci and now I know what to make with it - a pre-Easter pasteria! The lattice top version of Pastiera is quite lovely I'm sure, but you're right this version is lighter. Perfect way for you to use that 3 lbs of ricotta! Thanks Liliana and enjoy! I make this every year and thought i was making ricotta pie. I add soak raisins in rum and the add them too. 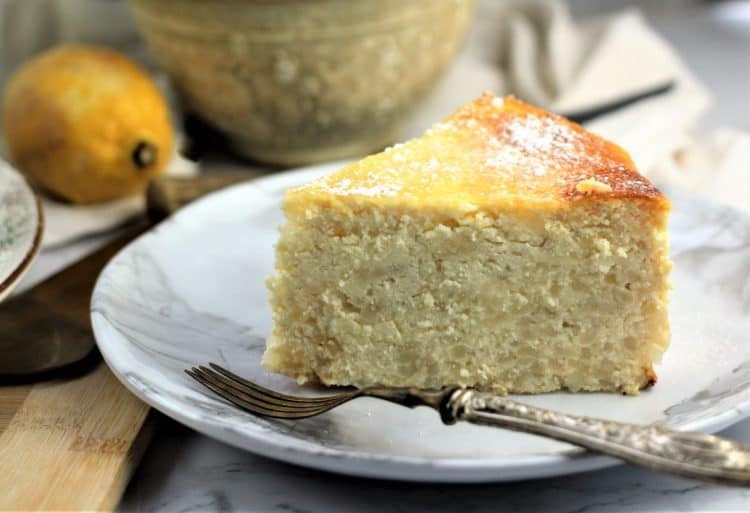 What is ricotta pie? I don't care for baking to much but i do make Crescia every year. 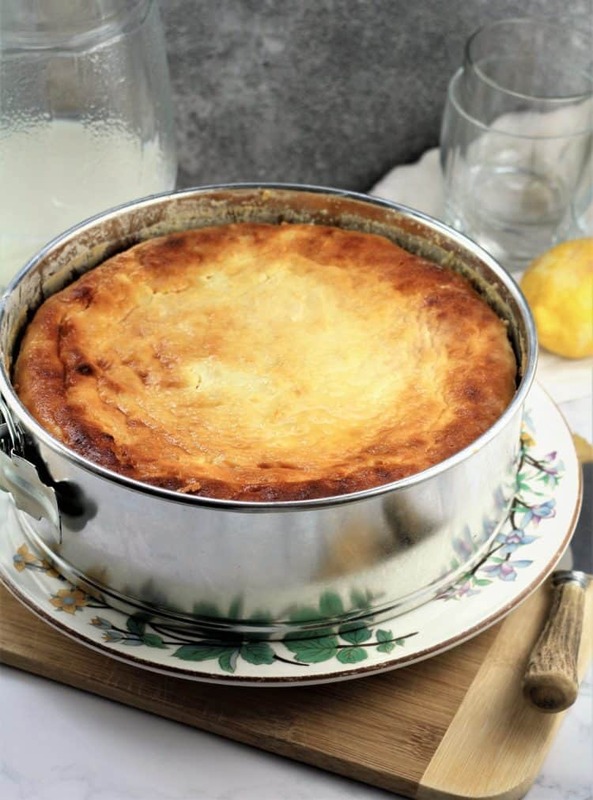 Hi Linda, pastiera is typically made with ricotta and rice or grano cotto. 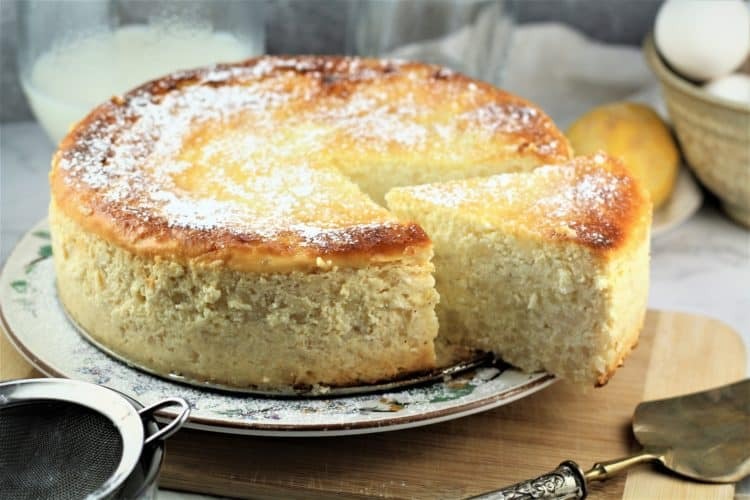 Ricotta pie is simply a ricotta filling. 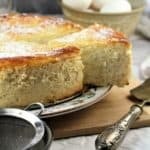 I have a recipe for my mom's ricotta pie on the blog as well at: https://www.mangiabedda.com/ricotta-pie/. Thanks for your question Linda! Nadia, there are so many versions of Pastiera, at least one in each of my 4 aunts plus mama's, all from Naples, most did indeed include citron or candied fruit. Mama also made up a chocolate/rice/ricotta version to die for. 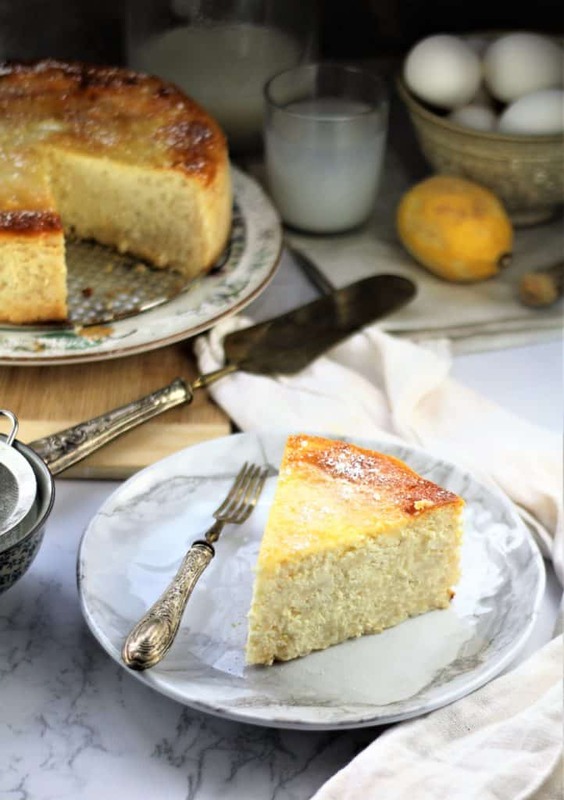 All used crusts but I am not a crust person either and I like using a spring form for any ricotta pie/cake and yours is a good simple version that I will certainly make this Easter, along with Pizza Chiena and Pizza Rustica. Always trying to keep tradition going for my small family, much as you. Keep up the good work. Hi Anna, indeed there are lots of versions. Your mom's chocolate version sounds amazing! Is it with cocoa powder or chocolate chips? While I do enjoy a good pie with a flaky crust, sometimes I don't feel like making crust and that's why I like this easy version of Pastiera. I have yet to make a pizza chiena, it's definitely on my to do list! Thanks again Anna! Mama used a chunk of chocolate that she grated into the cooked Arborio ... which, by the way, she would pass through a ricer after it was cooked and while still warm would add the chocolate, vanilla, orange rind and a small amount of orange juice. Eggs, of course, and when all cool, added the ricotta. I'm sorry I don't have accurate measurements, you know what it was like trying to get an accurate recipe from our mamas and I very much doubt that mine even had a recipe. Somehow when I make it I just go by feel and it turns out OK. Incidentally, no dried fruit, raisons or citron in this one. If you ever find time in your ultra busy schedule and try to perfect this one maybe you could post it here on your blog? Anna, that sounds absolutely delicious! I've never heard of passing the rice through the ricer, so that way it's almost puréed? I would love to be able to post that version one day so I'll add it on my ever long to do list. Thanks for sharing! Love this dessert! Our family makes it a little different but I will definitely have to try your version. I looks amazing! Thanks Angie! I know the traditional Pastiera has that beautiful lattice top crust which is delicious for sure. I like this version 'cause it's quick and easy and sometimes I don't feel like making a crust! Hello Debbie, the measurements are indeed correct am in fact by now the milk has probably been absorbed. It takes about 30 minutes. Let me know how it turned out. Thanks for your question!